Our bridesmaids department is the size of most regular bridal stores and features Calgary’s largest selection of bridesmaids designers and dresses in a single location. Not only do we carry all price ranges, but offer full consultation service by trained professionals to help you and your bridesmaids find the perfect style for the theme of your wedding. We want your entire wedding party to look stunning, unique and match your dream for your wedding day. This attention to detail is what sets us apart from other salons. 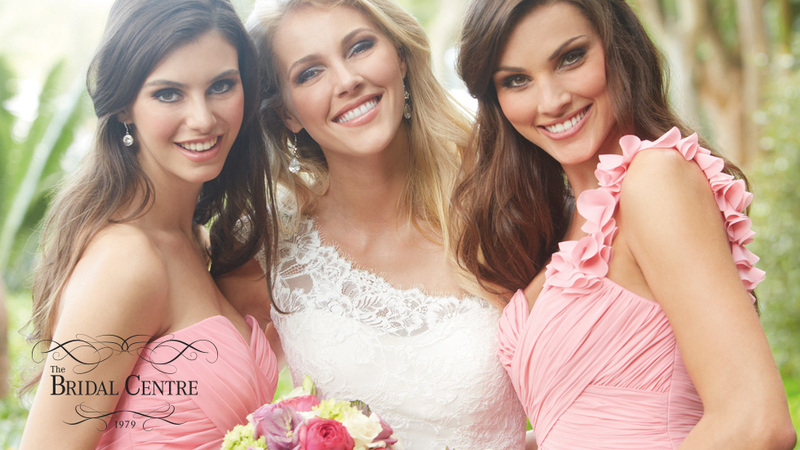 We offer special pricing to those brides who have purchased a Bridal Centre membership. You will receive 10% OFF ALL BRIDESMAIDS dress prices for your entire wedding party. 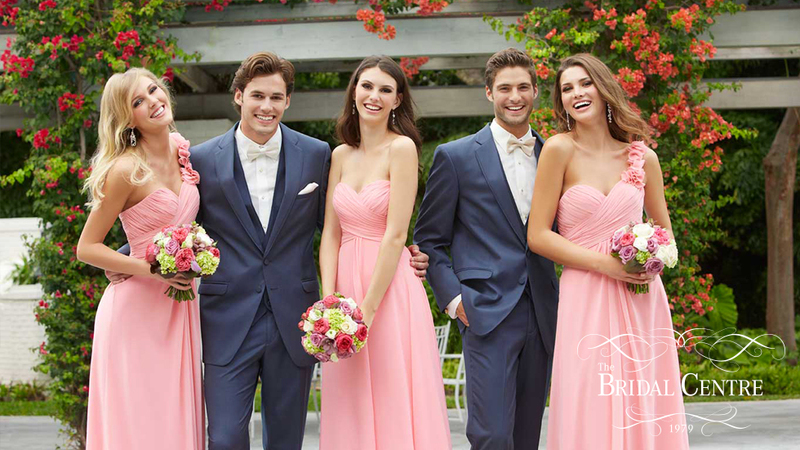 When your groomsman rent the same number of tuxedos or suits, your membership entitles you to 20% OFF ALL BRIDESMAIDS. This ensures you get the BEST POSSIBLE PRICE for your bridesmaids and groomsmen and having a fully coordinated wedding party. We are the only store that offers service appointments with a trained bridesmaid consultant to help you coordinate your bridal dress, colours and sizes and help you make the best possible choice for your wedding party. There are a lot of details to be taken care off when it comes to ordering your bridesmaids dresses and our advanced computer system will ensure that everything is on track and that your dresses are delivered accurately and in the best possible timeframe. We help many brides, each and every year, recover from the mistake of ordering on the internet. It’s easy to be lured by the promise of the best possible price that is too good to be true! Hundreds of brides were scammed on counterfeit websites that popup on a daily basis with stolen images offering dresses at super low prices. These are fraudulent scam websites. US PRICING doesn't take into account DUTY, brokerage fees, credit card charges, exchange rate and shipping. On average add $50 to $80 more per advertised US prices on bridesmaids. Brides found that they were often shipped dresses they didn't order and/or in the wrong size. It is costly, expensive to return goods to the US. Bride found it difficult to get alteration work and services because the dresses were purchased online. Online stores frequently go out of business leaving the bride without her money and her bridesmaids dresses with only weeks left before the wedding. It's a disaster. Don't take our word for it! All of our designers do not recommend that the bride condone purchasing bridesmaids dresses over the internet. Our membership program ensures that you will get the possible possible price, with service and guaranteed delivery. All brides and bridesmaids leave it too late and don’t leave enough time for alterations and delays. It takes a minimum of 12 weeks for special orders to ship and you will need several weeks for alterations. Order early to avoid stress. We like to remind all Bridesmaids that it is an honour to be invited to share in the couples day and that you will want to defer to the brides wishes about styling, fabric and colour choices. 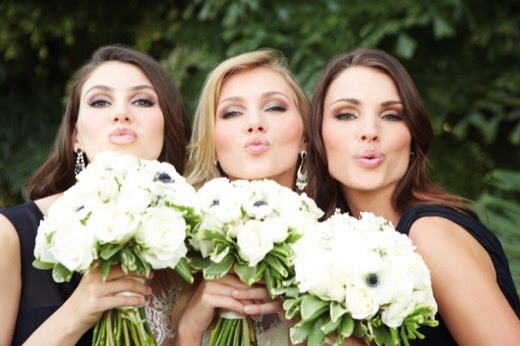 It's best to discuss budgets and what you will expect your bridesmaids to pay for up front. Budget for the dress, shoes, alterations, makeup and hair. This eliminates any misunderstandings or contention down the road. While we will provide expert measuring and sizing advice, we ultimately have each bridesmaid choose her own size. The expectation that the dress will fit without alterations is incorrect. All dresses will need alterations. Dresses are not custom made to the measurements. We do not include this costly service in our prices. Expect to pay a minimum of $60 for alteration services. Some designers will have RUSH or SUPER RUSH fee's for quicker delivery. Instead of 12-14 weeks, for an extra fee gowns can be delivered in 6-10 weeks. It varies by designer and call also vary by the time of the year. Most all of the designers charge an extra fee for extra length on a gown. This will normally apply to taller bridesmaids and is also based on the shoe height that is selected. Always a bridesmaid? Maybe if you check out our Wedding Dresses it could be the start of something new!